Let’s keep showing all people that we care. Let’s keep proving our worth through action. And let’s accelerate our efforts to move our world forward and leave no one behind. My thoughts are with the families of the victims and I send my best wishes to all those injured, hoping for a full and fast recovery. The United Nations stands with all Kenyans and with everybody, everywhere, in our fight to counter terrorism - the most dramatic threat our societies are facing in today’s world. Let me now begin by wishing you a happy New Year -- and thanking you for your strong support throughout 2018. In my New Year’s message one year ago, I issued a red alert for our world. As we look ahead to 2019, I won’t mince words. Alarm bells are still ringing. We face a world of trouble. Armed conflict threatens millions and forced displacement is at record levels. Poverty is far from eradicated and hunger is growing again. And the climate crisis is wreaking havoc. We also see growing disputes over trade, sky-high debt, threats to the rule of law and human rights, shrinking space for civil society and attacks to media freedoms. These ills have profound impacts on people’s daily lives. And they are deeply corrosive. They generate anxiety and they breed mistrust. They polarize societies – politically and socially. They make people and countries fear they are being left behind as progress seems to benefit only the fortunate few. In such a context, it is not difficult to understand why many people are losing faith in political establishments, doubting whether national governments care about them and questioning the value of international organizations. Let’s be clear: the lack of faith also applies to the United Nations. In such circumstances, it would be all too easy to become demoralized or even paralyzed. But the truth is that the experience of last year proves that when we work together and when we assume our responsibilities, we get things done. Despite the headwinds we know so well, we have shown the United Nations’ added value. Thanks to your commitment, we have made a real difference. We have focused on results, making the United Nations more responsive and respected. Revenons sur certains acquis importants de l’année 2018. Un regain de la diplomatie pour la paix – engagé ou appuyé ou par l’Organisation des Nations Unies – fait bouger des situations perçues comme insolubles. Un dialogue encourageant pour la paix et la dénucléarisation de la péninsule coréenne a été amorcé. Un accord de paix a été conclu au Soudan du Sud. L’Éthiopie et l’Érythrée ont signé un accord de paix historique. La Grèce et l’ex-République yougoslave de Macédoine ont fait de solides progrès pour régler le différend qui les oppose sur le nom du pays. Des progrès sur la voie d’une transition démocratique et d’une plus grande ouverture ont été réalisés en Arménie et en Asie centrale. Nous espérons maintenant que le processus électoral en République démocratique du Congo se conclura sans violence et dans le plein respect de la volonté du peuple congolais et des règles juridiques et constitutionnelles du pays. D’autres avancées fondamentales ont été faites sur des enjeux vitaux. Tout au long de l’année, nous avons approfondi notre engagement auprès des jeunes et lancé Jeunesse 2030, une nouvelle stratégie d’autonomisation des jeunes. Nous avons aussi pris des mesures sans précédent pour promouvoir la parité entre les sexes. Pour la première fois dans l’histoire de l’ONU, nous avons atteint cette parité au sein du senior management et parmi les candidats au poste de coordonnateur résident. Nous faisons tout ce qui est possible pour créer un environnement professionnel sans harcèlement ni abus de pouvoir de quelque nature que ce soit. We should draw encouragement from our achievements. At the same time, we recognize that many people still see our United Nations as ineffective, cumbersome and bureaucratic. We all want a more nimble, effective, flexible and efficient Organization. That is why we are reforming ourselves in ambitious ways – to better serve the people. Our peace and security architecture has been fortified to strengthen prevention, mediation, peacekeeping and peacebuilding. Underpinning these changes are new management capacities, structures and practices, including new levels of transparency, simplification and accountability that will hopefully, deeply transform the organization. On January 1st, I issued new delegations of authority to more than 200 heads of UN entities. This will cut red tape and bring decision-making closer to the point of delivery – a key reform objective. We are also improving the regional balance of our staff, recognizing the immense value of geographical diversity at all levels, unfortunately not always fully understood in the past. 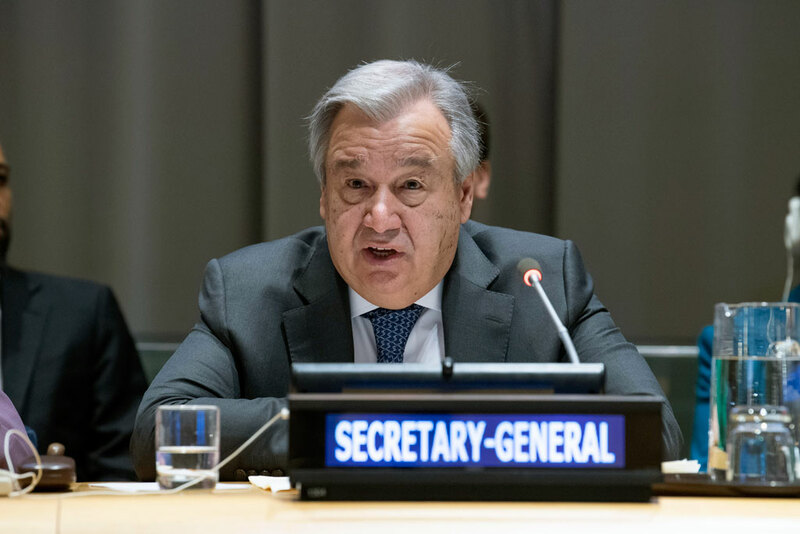 With two years of reform discussions and decisions now behind us, 2019 will see a renewed United Nations working for all. While recognizing the progress we are making, we cannot be complacent. To meet the needs and expectations of the people we serve, we must accelerate our work. It starts by accelerating the surge in diplomacy. Partnerships are fundamental – none more so than in our engagement with the people of Africa. We will continue to strengthen our partnership with the African Union as we strive to consolidate gains towards peace on the continent, and press for lasting solutions in Mali and the Sahel, South Sudan, Somalia, the Central African Republic and the Democratic Republic of the Congo. Last month’s Stockholm Agreement on Yemen helped to avoid a catastrophic military confrontation in Hudaydah that would have greatly increased the risk of famine. But much more needs to be done to ensure that the parties live up to their commitments, and that a true political process finally leads to peace. In Syria, the war is far from over. Millions of civilians remain displaced and under constant fear of yet another humanitarian catastrophe, particularly in the northeast and northwest. My new Special Envoy will continue to push for what remains the only solution: a political path– in accordance with Security Council resolution 2254 and the Geneva Communiqué -- where the voices of all Syrians are heard, and grievances can be addressed in a peaceful and equitable manner. Unfortunately, a number of peace and security challenges remain frozen or unresolved, from the Caucasus and Ukraine to Myanmar and the Israeli-Palestinian conflict. On these and other matters, the unity and support of the Security Council will be crucial to overcome the deadlocks. And as we strive to end conflicts around the world, we understand that lasting peace must be based on a broad consensus of society, with women as full participants in all peace processes. In this fast-changing world, standing still means falling further behind. On three key 21st-century challenges, we need to dramatically accelerate our efforts in 2019. Quite simply, we must put our pedal to the metal. First and foremost, to fight climate change. There is no greater challenge to the world of today and tomorrow. The threat is on a clear trajectory: hotter, faster, more severe. Science is clear. And things are even getting worse than what was forecast. Last week, a study found that ocean temperatures are rising 40 per cent faster than the world’s top scientists predicted just five years ago. Over the next decade, we need to transform our economies at an unprecedented scale to keep temperature rise to 1.5 degrees. By 2020, under the Paris Agreement, Member States are meant to assess progress and submit new pledges to meet the goals to which they agreed. And by 2050, we need to reach net zero global emissions. That means enhanced efforts now, both to reduce emissions and to seize the opportunities of a clean, green energy future. That is why, I will convene a Climate Summit on September 23rd to mobilize action by political leaders, the business community and civil society. We need greater ambition – ambition on mitigation, ambition on adaptation, ambition on finance and ambition on innovation. I appeal to world leaders to bring solutions and commitments that will at last match the scale of the challenge. Second, alongside a dramatically improved response to climate change, we must strongly accelerate our broader efforts to achieve the Sustainable Development Goals. Despite considerable efforts from Governments and many others, the transformative changes demanded by the 2030 Agenda are not yet being made. We need a sharper focus on what works in reducing poverty and inequality, and in delivering strong and inclusive economies while safeguarding the environment -- and we need increased financing for those solutions. I urge you all to do your utmost to make September 2019 a defining moment for stopping runaway climate change, achieving the Sustainable Development Goals and building a fair globalization. The Fourth Industrial Revolution continues to open new possibilities for health care, education, humanitarian assistance and much else. But alongside these benefits, we must address the disruption of labour markets, the weaponization of artificial intelligence and the heinous activities on the dark web. Across this work, across the world, what really matters is people – “we the peoples”. And what guides us is a set of values – the universal values of the United Nations Charter that binds us together. Peace. Justice. Human Dignity. Tolerance. Solidarity. Today, those values are under attack around the globe. An ideological battle is taking place. Most disturbingly, we hear the troubling, hateful echoes of eras long past, and noxious views moving into the mainstream. Let’s not forget the lessons of the 1930s. There can be never room for hate speech, intolerance or xenophobia. We will fight it anytime, anywhere. But we must do more. We must go deeper. But I am equally certain that we must at the same time invest in social cohesion, in education, in new skills for people to adapt, and safety nets for those that risk to be left behind -- never forgetting the coal miner, the assembly line worker, and all those across the world, destitute or caught up in crises, afraid of being left behind. We need a new campaign for values – for the human rights and human dignity that we hold dear and that must be made real in the lives of all. In that spirit, let’s keep showing all people that we care. Let’s keep proving our worth through action. And let’s accelerate our efforts to move our world forward and leave no one behind.